My Google Glass arrived today. First impression...they rock! I have rarely seen a product generate such awe as Google Glass did with the people I shared them with. Google, thank you for being cool enough to put out a technology early in the product development cycle rather than waiting for 'consumer perfection'. Basically, I'm totally jazzed about the possibilities of Glass. After the initial hour of exploration and play time, I couldn't help but think about the possibilities. I want a Glass-based WiFi security scanner app. I want a facial recognition app. I want location / context enrichment. I want a body language interpreter app. I want a…time to start digging in to the API. Anyway, I fired them up with no instruction, except the brief navigation tutorial provided on the Glass. This got me to basic usage. I did quickly find that I needed to RTFM to understand how to fully navigate the UI. Google must have some good optometrists on staff, because Glass is very comfortable and the screen works quire well. The user interface is good. The display appears to be projected a couple of feet in front of your eye. They don't try to cram too much on the display and the font is nice. Navigation takes some getting used to. I'll be figuring that out over the next few days. My initial sense though is that they've done pretty well, both finger and voice based commands. 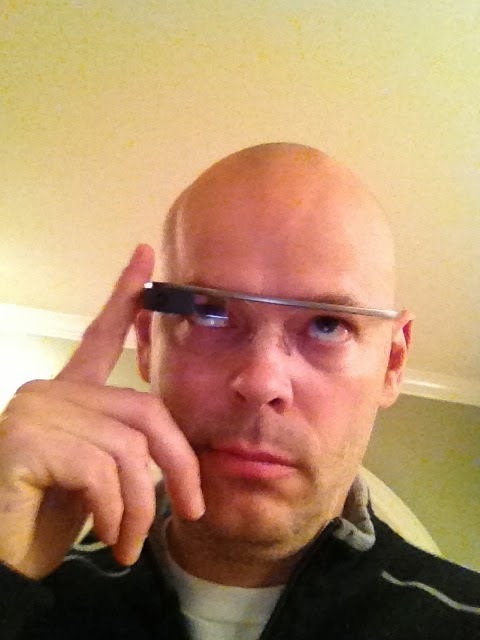 Inherently, I want Glass on the Internet all the time - like my cell phone. Unfortunately, tethering to your iPhone requires that you pay your phone company for 'personal hot spot' services - an extra $29.99 per month (not the case for an Android phone). No way. I'm already paying over $200 / month to those #%^$s. Fortunately, I was able to grab a MiFi mobile access point from work. So I'll be toting around Glass, cell phone, and MiFi. Time to bust out the Batman utility belt. Glass battery life on a full charge with what I would think is 'normal' use is about 4 hours. Not bad. Could be better. I'm wondering if they will put out a dual battery model, with batteries on both sides to further increase battery life. I'm betting we'll see external battery pack add-ons.